Please contact me if you want to share your example programs for Remokon and/or akaRemote. I’ll link to it from this site. The program would be for Max, SuperCollider, Processing, Flash and so on. 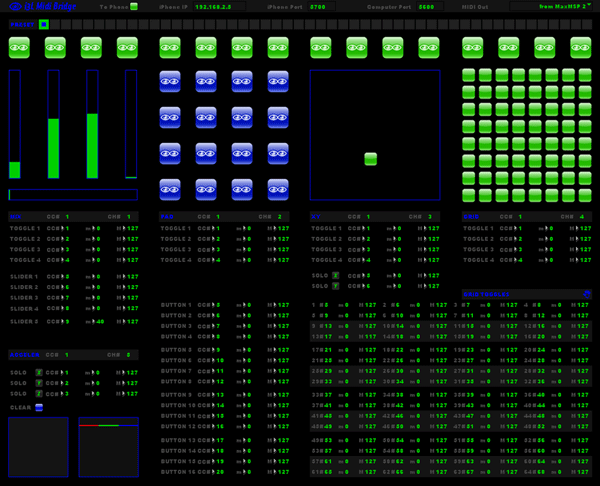 Remokon is an OSC (Open Sound Control) compatible wireless control application. 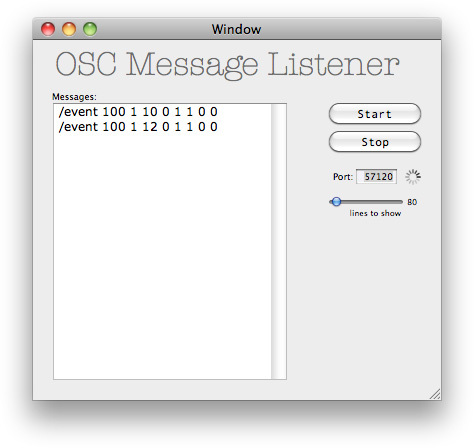 You can develop programs using OSC compatible programming language (i.e. Max, SuperCollider, Processing, etc.). For example, you can play the piano when you push a button and change lighting color when you move a slider. Please note that this application is meaningless without a receiving program. You can download example programs at the support site. 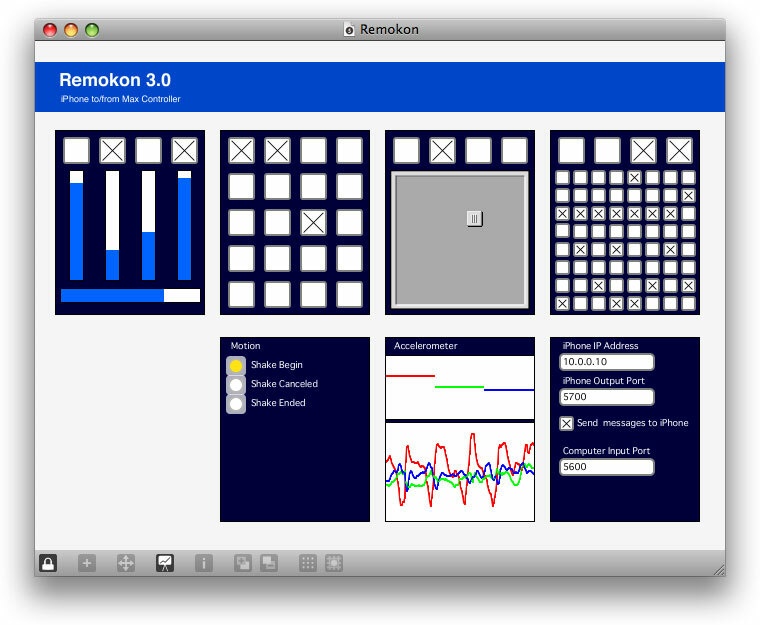 Remokon was previously known as akaRemote.app and is now compatible with iPhone OS 3.0 and later. Remokon is backward-comaptible with akaRemote.app and you can use your programs without any modifications. – Larger and iconized page selectors. This is the source patch of RemokonMonitor application. [NEW] Kiyoyasu Suzuki creates a Quartz Composer and Remokon demo. Realy want to have it again. Any help with connecting and using the app please? I’m writing SuperCollider and Remokon example. Please wait for that ! 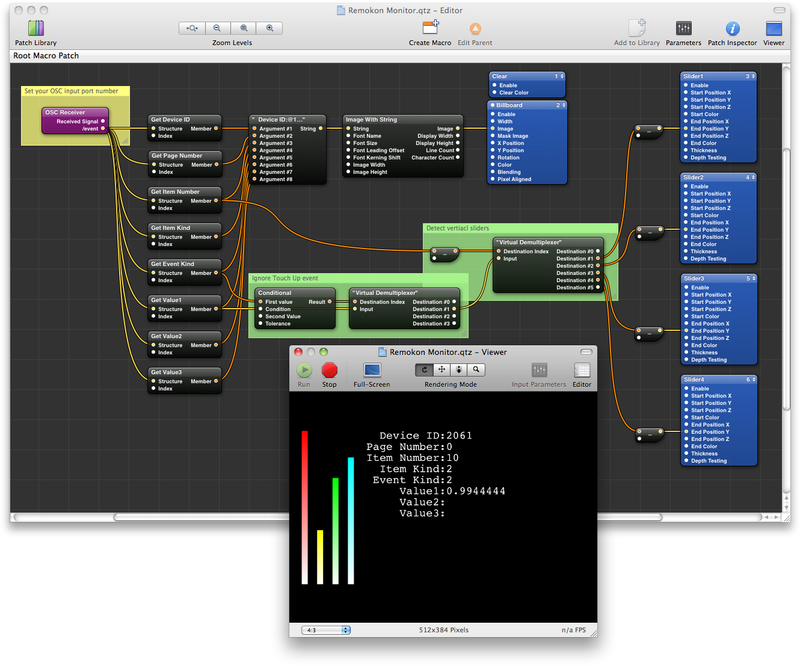 Here’s what i’ve produced with MAX/MSP. It’s a basic monome style sequencer. MAX patch will be up on my blog soon. James, Great work! Let me know when your patch is ready. I have now uploaded a beta version of my iPhone monome. It’s a bit messy but all works. I have also included a PDF documentation on how to use my patch. I would be very interested also too see what other people can produce audio wise with my patch too. Thank you, James. I updated this site. excellent program, purchased for my iPhone, when a version for iPad? would be great. 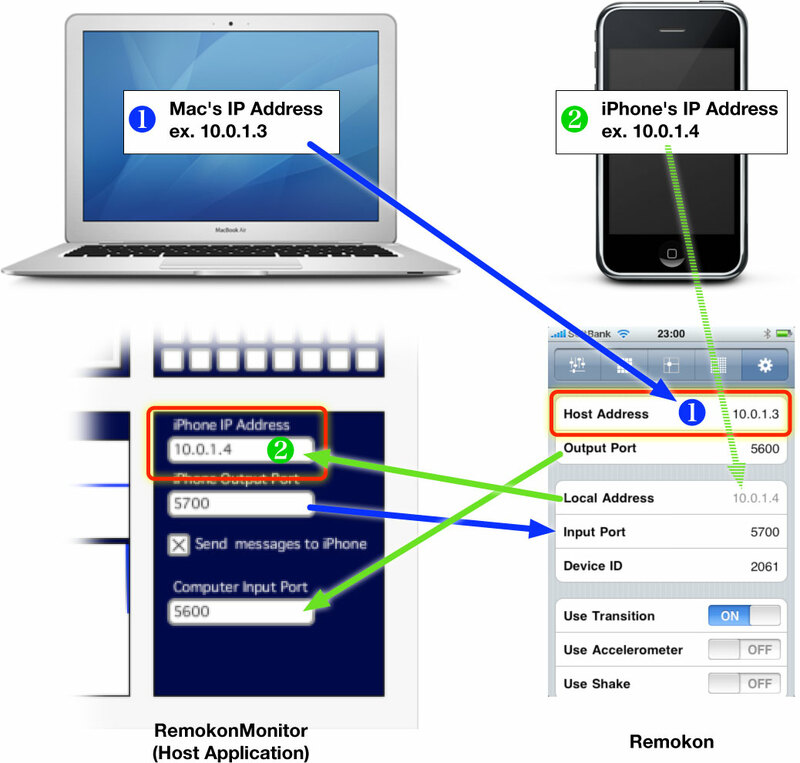 it is possible to connect 2 iPhones together with i3l? Hi lglollo, You should ask the author of i3l but I think you can do it. sorry i can not to use this app when i setup network already. them connected and then i will open remokon but app not run. Hi nui, Would you let me know your environment (model and version of iPhone/Mac/Client Application) ? What do you mean by “app not run” ? Thanks. Hi steve, I’m not a PC guy. I don’t know the detail on PC but I think all you have to do is same on Mac. thx for the quick answer. I’m just wondering if there is an equal to RemokonMonitor for mac. However, I came to this page trough an article about famitsu mode this year. Those kind of oldschool electronic music fits probably to a game which I’m creating right now. I’d like to play with the interactivity of a game combined with music, but it’s quite hard to achieve nice results. Do you have any experience making harmonized music tracks for video games? Can this work somehow with Apple Logic? I can’t afford another DAW at this time. I’d love to use something like this and am trying to understand it. thanks! 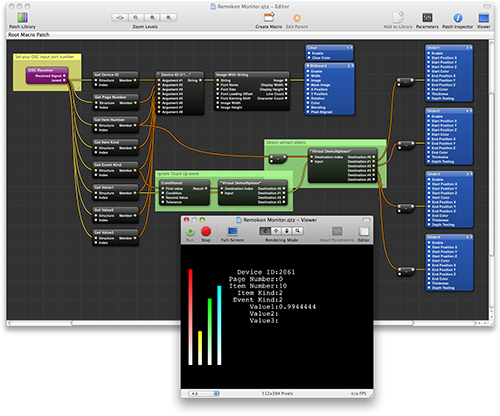 Hi rezo, I think you can use a OSC-MIDI converter like “OSCulator” to communicate with Apple Logic.